In this episode I will talk mostly about the changes made to how hedgehogs spawn and how fort mode got upgraded. The outcome and fun of a match depends on the entire course of a game, starting with the initial positions of your hedgehogs! The game already tries it bests to find good places for all your hedgehogs, but it could completely fail to do that when the entire map was mostly empty or filled up with land! nemo made the game able to deal with maps that have too little land or space for hedgehogs. If there is too little land, hedgehogs and a platform below them can be spawned in mid-air. If there is too little free space, holes will be created to place those hedgehogs in. The Divided Teams scheme option will work with several teams now (instead of just 2). The Fort Mode game modifier in the game scheme options has been there for a long time now, but it took a few steps to set it up and many players didn't even realize that it existed. 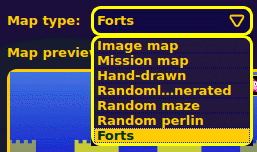 Forts will be a map type! Also we got rid of the annoying restriction of a maximum of 2 clans/forts per battle! This means it's possible to have fort battles with up to 8 forts and teams! And because - why not™ - we decided to make the distance between forts adjustable. In the animated gif on the right you can see how the "feature size" slider will affect the preview's "gap size" between the forts. Note: The generic preview forts are a about as wide as an average fort, however the gaps could be bigger or smaller based on the actual forts widths. 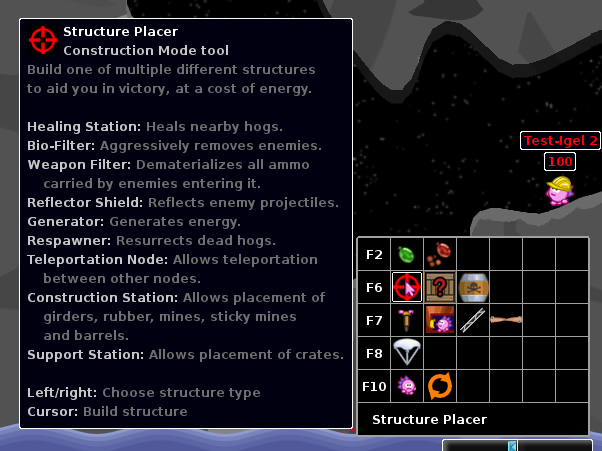 Multiple forts also work in Construction Mode, which also has received several fixes and tweaks. Thank you Wuzzy! Do you have opinions or suggestions regarding above topics? We'd love to hear them, please leave a comment! Nothing of this is news to me, but I really appreciate those BehindTheHedge posts. 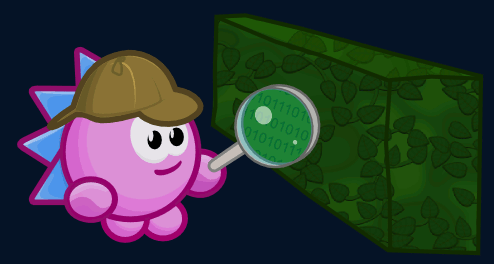 The remainder of this post will be unstructured (mostly self-serving) ramblings about new Hedgewars features, both official and unofficial. I include it for those who are VERY curious what's going on, sorry if it is a bit messy but I am pretty K.O. right now. Sheepluva also added a “cinematic mode”, simple black bars for cut scenes, this makes it easier when you are seeing a cut scene rather than playing. Currently, only 2 missions make use of this feature but hopefully there will be more later. Regarding the Construction Mode “tweaks and fixes”: This refers mostly to bugfixes and slightly improved usability. One notable bugfix is that crate costs of this mode were all the same in 0.9.22, a rather embarrasing bug if you ask me! Construction Mode will also have support for script parameter in next release (energy-related). 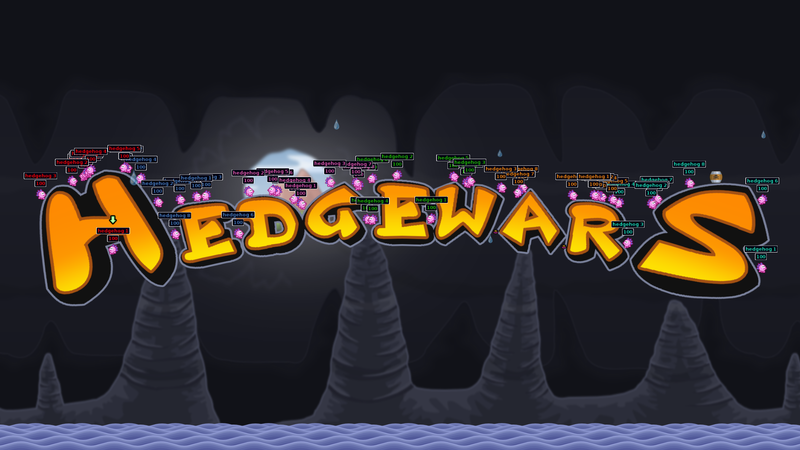 Some of you users probably noticed it, I have lately been doing quite some work on Hedgewars in the past weeks. I'm not an “official” developer, so sheepluva slowly includes / cherry-picks stuff from the code I have written. - Reworked missions/tranings screen, sorts mission into scenarios, trainings and challenges. This is very WIP and not finished, no promises! Is v0.9.23 ready? I'm so excited when the new version come out. I kinda want to add some kinda machinegun first. People keep asking for it. Besides, It's been around seven months since the v0.9.22 release. Anyways, I bet the new version will have some new soundbanks, like the gentlemen or something. The problem with new soundbanks is we lost our "pro" sound guy, Armagon, to Tiyuri's Starbound. Armagon wrote a guide to new voices on the forum. It seems to boil down to "use a decent mic, avoid external sounds by recording under a blanket, try to be funny sounding, speak slowly so when sped up for high pitched the voice sounds ok"
And then go wild w/ Audacity or whatever. At present we're trying to maintain his level of recording for standard voices. We're a bit more forgiving for localisations 'cause they are hard to find (we have a handful of localisations of Default). Most other stuff goes on DLC for optional install. Summer release, not impossible I guess. Depends on vacation/free time. We really should get more testing. unc0rr has made nightly windows builds, could try to get more people using those, testing screenshots, video recording, audio - stuff that might break in SDL2. My bet is late summer/early fall tho. frd *was* trying to resurrect the HTML5 port. That would have been darn cool. He disappeared a couple of days ago though. You're kidding. I didn't mean that i was betting with money. And Are you sure!? Armagon... DISAPPEARED? Oh NO! How are we suppose to do without him? Without Armagon, Hedgewars now has to rely on the community for new voices. May i create a thread that the voice actor wanted for new voicepacks? Is v0.9.23 will released ? Yes or No ? I Doubt about "This Time" HW Progress is Walking, even RUNNING ! ,,, please make me A BIG WRONG Guys !! !